The '50's an '60's school days were fascinating. We had the Cold War. We were in the "Duck and Cover Days.". We played outside every day with friends The famous 2.3 kids per house. We didn't have time for instruments. How did I find music? One party in high school. I picked up a Recorder. The woodwind. I actually made it work. I was hooked. Did I have the talent? Maybe. I can play the "Lone Ranger" song. Back to guitars. Playing guitar is the best fix ever. I'm 66 years old. jamndad, so1om, jimbojo and 4 others like this. Back about 1963 my best friend got an electric solidbody with one pickup and a small SS amp from Western Auto store in our local home town. He already knew a few cords. He started teaching me cords as he was learning lead parts. So I became his backup rhythm player, learning a little lead along the way. We played 100% instrumentals. Before long we went around playing at people's houses. We did Tell Star, Outer Limits, Pipe Line, Walk Don't Run, Ronchy, Forty miles of Bad Road, Rebel Rouser, Sleep Walk----and such. so1om, mb doug, Davis Sharp and 3 others like this. I have a much older half sister who when I was 5 years old married my brother in-law who played and sang folk songs on a Gibson LG-2. This would have been in 1967-68 when he showed me a C chord on his guitar and then that's all I remember until I was 13 or 14. I guess for some reason at age 13 I wanted to play guitar and be like Woody Guthrie so my parents bought me an el-cheapo 6 string acoustic and after 2-3 lessons trying to learn Beatles tunes with some hippy guy I was on my own...the rest is history. jamndad, so1om, jimbojo and 2 others like this. I am really loving these stories. It is so cool to hear what got you hooked, every one is different and yet similar. jamndad, SoundDesign, OldGuitarPlayer and 3 others like this. About how I wasted my youth not knowing how cool those time were. jamndad, squierplayer and jimbojo like this. Two friends who were in jazz band (pianist and bassist), took me aside and asked if I would like to learn an instrument (bass), the bassist was graduating that year, and there was no one to replace him, they thought I'd be a good fit people-wise, and hopefully (with their help), I'd get by musically. That spring & summer, he gave me lessons, and I got seperate music theory and timing studies from her. I started formal lessons that fall, guitar came along a couple years later in my actual money making band. Some songs I just couldn't sing and play bass on, so I leaned a few chords, and swapped with the rhythm guitarist on those songs. When I started back up twenty years later, it was on guitar. OldGuitarPlayer, so1om, duceditor and 3 others like this. In June of 1965 I heard Kieth Richards cut down on "Satisfaction" and said to mice elf...I wanna play the guitar. At the time my Dad had a old Stella from the late 20's my maternal Grampa had gave him that I learned A, E, G and D on. I'll dig up a pic of it. SoundDesign, duceditor, ElRey67 and 3 others like this. I grew up around music. Mom had a piano in the house... Story & Clark, nothing fancy. She was a church organist. I took two years of piano lessons, but I got ridiculed quite a bit... it wasn't masculine in 1979 to be a male piano player in the Mississippi Delta. When I was 15, I got a keyboard. 61-key Yamaha MIDI. Really cool, but somewhat limited beginner's model. I played with a few bands for a few years, but tired of playing keyboard. Besides, I never got very good... I was an "ear" player and my early days in piano lessons, I pretended to read the music (which I found extremely difficult to comprehend) but I was really playing by ear and following the patterns my instructor made with her hands -- I always asked for her to do a run through before I tried. If I got REALLY stuck, I could figure out where I was and read my way out of it, but as the music got harder to play, it got harder to hear all the notes and it got harder to read. I was 19, could barely read music and had grown frustrated with fighting my instrument. Fast forward to age 40. I decided that I wanted to start playing again, so I bought my first guitar. I knew about four chords from my band days (Em, G, D, C, Am, I think) and I started banging away. Been playing since. I still have a good ear, but I do struggle with hand/finger coordination. That said, I am finding I learn faster on guitar -- even at middle age -- than I did on keyboard as a kid. Plus I don't have to worry about getting my a$$ kicked on the playground because I play guitar now! OldGuitarPlayer, so1om, duceditor and 2 others like this. I really should add a part about my Grandpa Hudson LaMore. Even though he lived in North Arkansas and I was in North Louisiana, we visited him and Grandma Nola on vacation. In the evening after supper we would sit out on the porch and talk and he would play his guitar and sing and sometimes play his fiddle. He wasn't the greatest musician or singer but at the same time he put his full self into it to the point it was not just sound but a very visual performance with body movement and facial expressions. He had a recording machine called a Recordio that he recorded records. He would invite his musician friends over and record the sessions on the Recordio. It just so happens I inherited all his old records. When I learned to play guitar I got to jam with him on some of my final vacations there before he passed away. I only realized what an impact he had not only on playing guitar but also in getting into recording later on in years after he was gone. I did take some of his old records and put it on a multi track recorder and added bass, drums and keyboard. I included a sound cloud track of one of his recording with my add on parts. On this recording he is singing and playing rhythm guitar, I added bass, drums and keyboard. This was done way back in the 90's by me and his part was done in 1947. The song is entitled "Tessie"
late2guitar, Kickstand, OldGuitarPlayer and 9 others like this. TomL and Davis Sharp like this. Listening to all those great rock songs of the '60's got me going. I just KNEW I was going to be the next Henrix, Clapton or Page. Well, that didn't exactly pan out! So, I stopped and got involved with dirt bikes for ten years, shooting and raising a family. Fast forward to 2014 and wife and son bought a MiM Fender Strat for Father's Day. That just got the ball rolling again. Still have the Strat, but, play the crap out of that Douglas[avatar]. Mostly country flavored stuff from that Bakersfield crowd. There it is. Davis Sharp, 5ofeight and surfrodguitar like this. Thanks for starting the post. Very cool reading all the stories and our humble beginnings. jimbojo and ElRey67 like this. I don't know what happened to my post. Probably didn't submit. But, the above post is sooo awesome. Gramps must have been great. Wonderful. I decided I wanted to be a Rockstar when I was about seven and Kiss' Beth was on every station. It was the first song that made me realize that people actually did it for a living. Was that actually possible? When I was twelve, I kept pushing for a guitar. I got one and lessons to boot. It was not what the heck I was expecting. It was some odd wooden thing with nylon strings a hole in the middle of the body and no way to plug anything in. I think it was some sort of strange brand called acoustic? Probably out of business now. Then at 19, I decided to try again. I had been messing around with some friends' guitars. One of my friends, (still to this day a working musician) had a couple of 70s Les Pauls he had inherited from his late father. He was 16 and could play "La Villa Strangiato" and just about anything I asked him to. Not sure why I had so many problems playing the guitar. This guy made it seem easy. Since this was going to be so easy, I went down to Music Shack in Casselberry, Florida to go get me some lessons. It wasn't as easy as I thought but I figured it must be that I was having to borrow guitars from the shop for lessons. How was I supposed to practice? As the eighties were turning to the nineties, I would admire all the beautiful axes on the wall. They were pretty fancy, some had crackle finishes and lightening bolts. The brand names were things like Jackson and Charvelle. There were some of those old crappy guitars on the wall like those dudes in the fifties and sixties played. I figured that was for those ancient dudes in their mid-thirties. Go back to Woodstock ya' losers! The prices on the nice ones were pretty crazy. How the heck can a guitar cost as much as a car. I wasn't sure what I was looking for but I knew I wanted one with a locking trem system. I had no idea how to tune a guitar so it would just be easy to get one that locked so I wouldn't ever have to tune it. I played them all. None felt as nice as Dave's LPs but I did find a stunning one with the most awesome turquoise blueish hue. I had never heard of the brand name. It was Squier but I figured it was okay because underneath it, it said "by Fender." I had heard of Fender so I figured it must be good. I couldn't afford to get it outright. It was $450 but I put it on layaway and made payments every week when I got paid and went to my lessons. When I finally paid off the $450 and I got to take it home, I was pretty freakin' stoked. I kept up playing for a while but still couldn't figure it out. Also, the weird locking system actually made it harder for me to keep in tune and not the opposite like I thought. It was pretty frustrating especially since I had already decided that I was going to bring back Progressive Rock to the mainstream and that my music would be a weird combination of Genesis/Yes/Rush but somehow better than all three. I had pretty much come up with about two or three band names, I just needed to hurry up getting better and find about three other like minded dudes. Of course I didn't just bank on the guitar thing. It's good to have a backup plan. I was also a writer and an actor. For some reason, no one was discovering this multitalented Orlando stud and that was getting frustrating. After a while of being a Gen-X slacker I decided that my three back up plans needed a fourth backup plan. I told my friends I was going to go to law school. This was met with a little bit of skepticism. I'm not really sure why. I was clearly interested in college as I has spent five years at a two year community college. They laughed a little at me as we passed the glass pipe but I thought I could pull it off. And suddenly there I was, in the year 2005, married with one kid and another on the way, living in a suburbia Atlanta house, practicing real estate law and scratching my head wondering what the hell happened. I started looking at CL. I wasn't sure what I was looking for but I was bored. 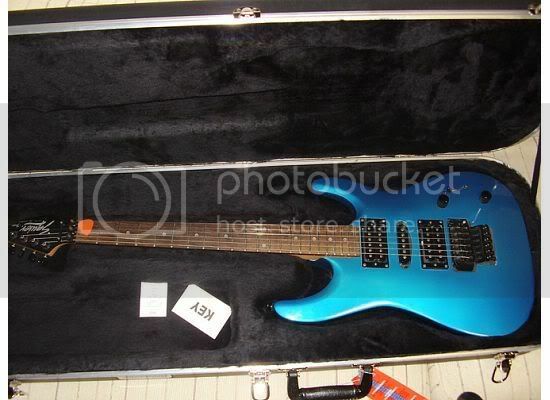 I found a weird looking guitar by BC Rich called a Warlock. It was only $80 and came with a tiny amp. I still had my Squier but it suddenly hit me. The reason I couldn't figure out the guitar thing was that crazy locking trem. Maybe if I just got a guitar that didn't have a locking trem it would be easier. Plus, now I was super-duper motivated. I didn't want to practice real estate law for the rest of my life and if I had to I needed to do something that gave me some sort of outlet. And finally after all those many years, I became one of the greatest guitar players of all time . . . wait a second, I didn't. I'm still not very good but I'm okay with that. I'm also okay with the wife, the now three kids and the Birmingham suburbia house. dallas721, Kickstand, OldGuitarPlayer and 8 others like this. "I was clearly interested in college as I has spent five years at a two year community college." Brilliant! I'm still laughing out loud as I type this. surfrodguitar and ElRey67 like this. Damn, these stories keep getting better and better. Can we get every members testimony and compile a digital scrapbook? We can call it "The Famous Unknown Players" or something like that but much better...include music, linear notes, original songs, cd, poster. Sell out and be rockstars!!?!?! ElRey67, jimbojo and Acidhouse like this. radiotech and eaglesgift like this. Blackface late 90's Blues JR.